Getting a Slice of Summer! Hello to all my darling prairie dogs! Summer is officially here! I got my slice of watermelon and I’m out on the streets of Ptown. What a great feeling to chat with friends from years ago, friends I just met, and friends I’d like to meet – if you know what I mean – wink, wink! I love being young and single! The weather’s been a bit cool, but the crowds have been hot during the start of June on the Cape. I officially kicked it off on Memorial Day and I’m running fast and furious until Labor Day. So make Provincetown a part of your summer plans. I’m also heading out to Rehoboth Beach, DE, in June and August for shows at the Blue Moon. And the Laurie Beechman Theatre will be my home in NYC on Wed, June 21 for a make-up show, since the weather closed me down in March. I don’t want to hear any more about Minnesota weather! For a complete list of dates all the way through November, just consult my datebook right here! Is it Tax Time or Ticket Time?!? I’m so busy, I’m hiring an assistant! I’m wrapping up my West Coast tour and soon will be heading the complete opposite direction when I motor to old Cape Cod for the summer. My new show “2020 Vision” is on sale at the Crown & Anchor where I’ll be hoofing it on the boards from Memorial Day until Labor Day! Get your tickets now – click and scroll down. I’ve been touring the new show for several months now and everyday it seems to get more current and precise. In fact, I almost have it memorized, which usually doesn’t happen until mid-July! Goodness, I hope I don’t peak early! It’s been a busy season. In fact my schedule has become so hectic that I may be employing a hand puppet for my less demanding appearances in the near future. It could work for later nights when people aren’t paying as close attention and it would definitely cut down on my budget for gum and Sanka. I think it could also prove quite convenient because, unlike most of my outfits, the puppet is machine washable. I’ll keep you posted on that. But until then, make your plans for Ptown. Rocketing around at the White Wind Inn, Ptown! My recent schedule had me motoring to some of my favorite places, such as Ft. Lauderdale, Philly and NYC. But this spring is particularly special because I’m visiting so many cities for the first time! I just toured Tulsa and met the nicest folks. And soon I’ll be seeing Seattle and Vancouver for the first time! But before all that, I’m on to Tampa, which I just found out is in Florida. How have I not been there before?!? I adore Florida! I always feel like a VIP since I speak English, pay with cash, and have a full set of teeth! Anywho, I’m super excited because this is also a fundraiser for TIGLFF, the Tampa International Gay & Lesbian Film Festival. You might want to take a breath in the middle of that! They’ll pulling out the red carpet for me, for crying out loud, I’ll be at the Hillsborough Community College – Ybor City Campus. Fortunately such places of higher learning don’t threaten me, as I attended two weeks of training at the Lakeland Dental Academy near Richfield. I didn’t graduate because I accidentally grabbed the Epoxy instead of the fluoride and cemented a woman’s mouth shut. It was an unfortunate circumstance, but a rather nice result, as I annually receive flowers and a card from her husband to mark the anniversary. So please let your friends in Florida know that I’m there Sat, April 8th. Get your tickets now! And still to come is San Francisco, Seattle, Vancouver and Cancun before I pack the kitty and head out to the Cape for a summer at the Crown & Anchor in Provincetown! Tickets are already on sale for that too! Good Vision for Holiday Cheer & Exciting New Year! My hopes and prayers to you for a peace-filled, joyous holiday season. I love this time of year and spend it at home with family, friends and fans who attend my holiday programs at the Illusion Theater! But I am also super duper excited about my plans for the new year. I have a whole new show planned that will thrill and comfort you at the same time. Bus tickets are purchased for me to travel north, south, east & west, as I head to Canada, Florida, NYC, Philly, San Francisco, and Seattle. The complete list is on my date book page and shows with tickets already available are just to your right on this page. Although I have never had perfect vision, I think we all need to be seeing 2020 for the next few years! There’s a lot of work to be done in our world today and I’ll help you see many bright, happy colors – other than orange! My new show will also offer practical help too, such as avoiding a fiery apocalypse. It can all be fixed! Come and see how Miss R makes life so much better with new songs, new videos, and a good old chin wag with my lovely audience members. I want to be seen in 2017! Oopsie, Put it in Reverse! My assistant was helping me with that last correspondence, since I was ordering pizza for lunch! Anywho, she reversed the linkage for my quality shows on the West Coast! I was notified by an alert fan! Thank goodness I accepted the charges! So I’m notifying all of you in case you’re ordering on your computers. And I hope you will pre-order, because then I know you’re coming and I won’t worry! Tickets also make great gifts for Christmas, Kwanzaa, Ramadan, or Chanukah (Jewish Xmas)! San Diego at Martinis Above Fourth on Wed & Thurs, Oct. 26 & 27. Palm Springs at the fabulous Camelot Theatres on Sat, Nov. 5th for Pride Weekend! Hope to see you all California fruits and nuts real soon! XO and one for “you-know-who”! San Diego & Palm Springs Here I Come! On my way … by land & by sea! What happened to summer?!? I think it’s gone! But don’t worry, as I have many, many exciting plans for the autumn season starting in San Diego & a cruise ship & Palm Springs & Puerto Vallarta … whew, I’m gotta start paddling faster! First of all, thank you to all who made this summer at the Crown & Blue Moon & Maine Street a lovely time. My campaign for the White House was well received and I can’t wait for election day. Whenever that is! Everybody loves bananas, grab one! Now my journey West is so special because I get to wear my two-piece. It doesn’t work everywhere, but someone how the fruits and nuts in California find it appealing – wink, wink! Of course I’ll be shedding my fruit for more fancy attire in San Diego at Martinis’ Above Fourth on Wed & Thur, Oct. 26-27th, and in Palm Springs at the Camelot on Sat, Nov. 5th! Those are campaign stops for me. Click here for tickets to Martinis or here for the Camelot. Or check out my date book! I want to see everyone and I want everyone to see me! Then after all that, I’m home for the holidays! Yes, I’m back in Richfield, as I do my holiday show at the Illusion Theater on 6th & Hennepin in downtown Minneapolis the first three weekends in December. Such a joy to be home and decorate my trailer for the holidays! It’s not quite as much work these days now that I leave the lights up year around! XO and one for Jesus! I have the answer to all of your shopping needs – birthdays, Christmas, Chanukah, Kwanzaa, Flag Day, Valentine’s Day, Passover, Arbor Day, Easter, and Ramadan! 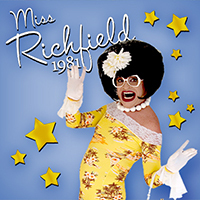 Everything you could ever want is now available at the Miss Richfield 1981 Store! That’s right, I’m for sale! I’m hoping this additional revenue stream soon will end my regular diet of cat food. Although the Cat Chow Indoor Tuna flavor warmed on a Ritz Cracker can be surprisingly satisfying late at night! Anywho, I’ve got bobble heads, CD’s, magnets, coasters and holiday ornaments! It all started in a darling store in Ptown, Urban Man Made at 184 Commercial St.(the old Marc Jacobs space). This amazing store sponsored my show this summer and offered to sell these wonderful items. But the store is much more than that – so you must stop and brows while you’re in Ptown.